Back in the 1990s, it was all the rage to play a game dubbed “Six Degrees of Kevin Bacon.” It all started when three college students in Pennsylvania were watching the actor’s performance in The Air Up There, and started competing to name all the movies in which Bacon had appeared, and other actors who performed with him. They realized that it takes remarkably few indirect relationships to tie Bacon to just about any actor in Hollywood — 2.95 steps on average, to be exact. The game is an example of the so-called “small world” phenomenon, or social network theory. Bacon — and, it must be said, more than 1000 other actors in Hollywood — is what’s termed a “hub” in social network theory. 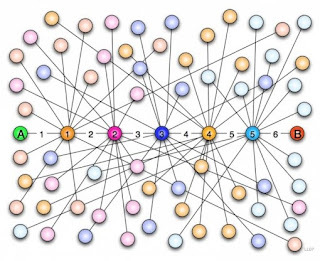 While most nodes in a network are connected only to a few other nodes, a certain small number of nodes are linked to many, many others. You know how major airlines pick certain airports as a home base, funneling their connecting flights through those hubs? Bacon would be Chicago’s O’Hare Airport. The World Wide Web, the stock market, even the anatomy of the human brain are all organized according to the rules of small world network theory. And now science writer Carl Zimmer reports that scientists are applying this approach to map out and study the complicated connections between species in an ecosystem, for example, sharks’ relation to their prey in the Caribbean. In the past few years, ecologists have begun to apply network theory to nature. By mapping the connections between species, they are discovering some of the rules by which all ecological networks are organized, and how these rules help foster biodiversity. They’re also studying how biological invasions, overfishing, and other threats are reorganizing these networks, and possibly putting them at risk of collapse. By discovering early warning signs of networks in trouble, scientists hope to be able to predict these collapses and prevent them from occurring. That’s one more quirky accomplishment Bacon can add to his resume. Maybe one day, ecologists will be able to consult their own online oracle wherein they can type in the names of select species and find out instantly where they fit into the vast interconnected web of their ecosystem. ‹ Creating a Conversation Through 'Creation"